The law requires that CMS implement Medicare recovery auditing in all states by January 1, 2010. CMS will implement the program on a rolling basis, beginning in 2008. Under this plan, CMS intends to award new contracts to four regional RACs (regions typically referred to as by Region A, B, C and D) by summer 2008. 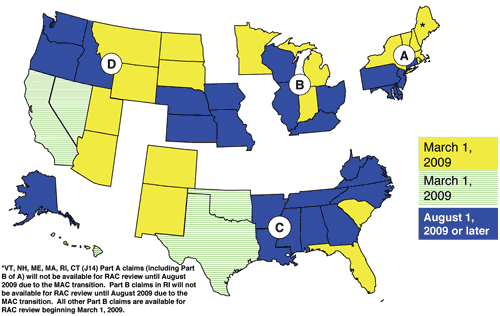 The map below shows the approximate schedule for actual claims review in the 50 states, which will be phased-in over the following 18 months. Under CMS’ proposed schedule, there would be a lag time before providers would begin to receive requests for medical records after the program is rolled out in each state due to the process RACs must follow to operationalize the program. It is unclear how quickly hospitals in the RAC demonstration states might begin to receive medical record requests under the expanded program, but it could start sooner than in other states as systems are already in place.